Kick off the Holiday season at our annual open house. It's a great way to catch up with friends while enjoying wine, hors d'oeuvre's and sweets. You can also shop for discounts, up to 20% OFF! With crafted, unique, boutique gifts - check of your holiday shopping list too! During this open house, we are able to raise a glass to each of you for the support and love you have given to us for 11 years! Without that love and support we would not be here and for that we are truly grateful. THANK YOU! Free parking behind store. Cheers! Hostess or Holiday gifts...we have what you need. We carry unique holiday accessories for your decor needs. Punch up the fun with these table top glitter trees. Or add a touch of gold to your tablescapes with these gilded gold mushrooms. Seasonal flowers are our specialty. So don't forget to put in your order for your Thanksgiving centerpiece early. Let Mulberry Row create a one of a kind floral arrangement for you or your loved ones. We deliver city wide, and with all the beautiful Fall flowers now in season, let your friends and family know that you're thinking of them. These candles add an exquisite addition to anyone's home. Made from pure soy these candles burn clean for 150 hours and create a warm and cozy ambiance for the holiday season. We carry a great selection of gifts during the holidays. Treat yourself or friends to fragrant wax sachets. Holiday scents include: spicy apple and forest. One of our best selling candles this year is the Seda France candle with a carved floral lid. Scents include White Patchouli, French Blossom, and Bergamot Lavender. Aum & Garden will be participating in kicking off the holiday season. Penelope Rose joins the crew at Mulberry Row! 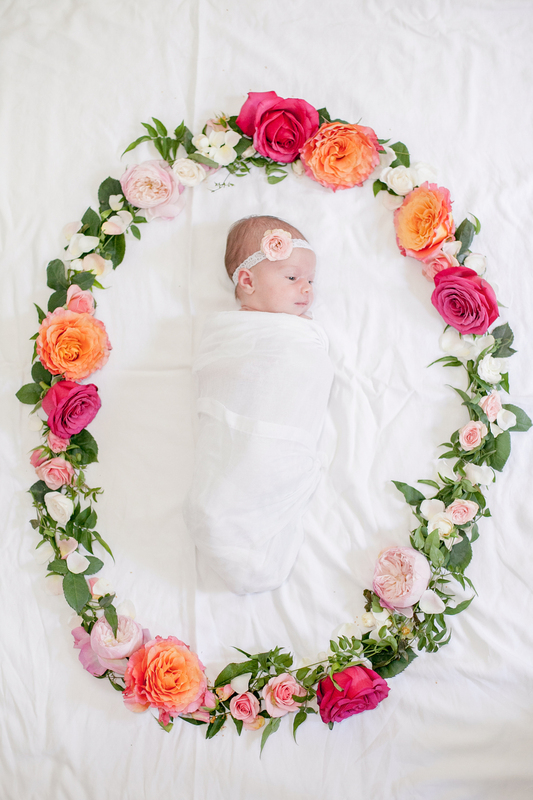 We welcomed Penelope Rose Tomlin to the Mulberry Row crew on October 10th, 2014. As the newest addition to the family we are thrilled to have her at the store periodically. Stop by and you might get a chance to meet her! Major news! Mulberry Row has expanded into a new space! We're thrilled about our new store, with three times the space — enabling us to serve you even better. And the best part is... we're just a few doors down, on the same block! Please note our new address is 13327 (right next to Nesmond Café). 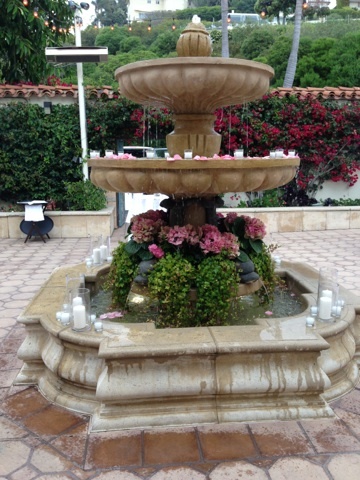 Follow us as we prepare for a wedding. Just back from the LA Flower Mart with hundreds of roses in shades of whites, creams, and blush. These bouquets will become the chair decor. These bouquets will become the composition style centerpieces. The lavender will be tucked into the napkins on the dinning tables. One car loaded up with over seven dozen vases and over one hundred candles that will transform the room for the reception. Creating the ceremony site. The Chuppah was draped in yards of chiffon. Fabric was laid down to create the aisle runner. Almost done. Laying down the rose petals. One hundred roses where used. A close up view of the floral tie backs attached to the Chuppah. 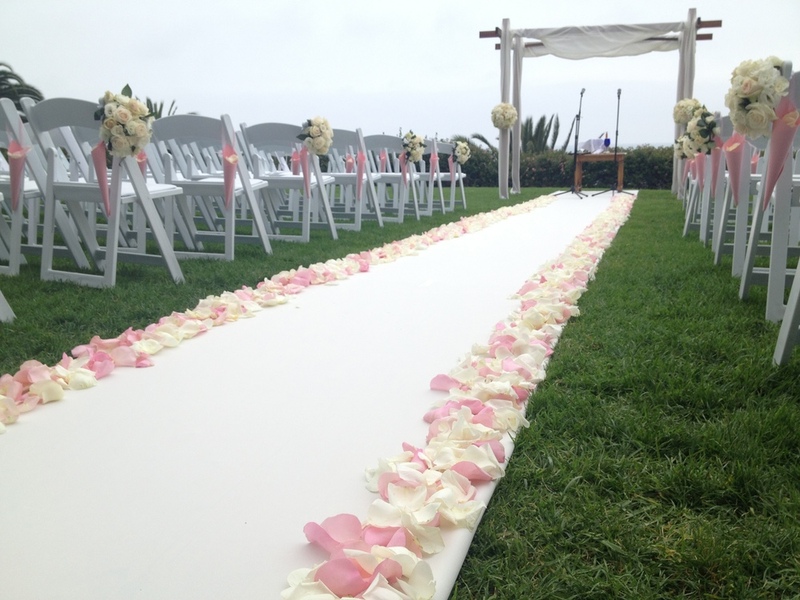 The completed ceremony site with Chuppah, aisle runner and petals, chair decor and paper cones filled with white roses petals. Now on to the reception. Dinning tables and the sweetheart table. Bridesmaids, and the Maid of Honor bouquets. The Bridal bouquet made with garden roses, lisianthus, calla lilies, and ranunculus. The bouquet was wrapped in ivory satin ribbon with an overlay of mesh and embellished with pearl pins and rhinestone buttons. Lovely.